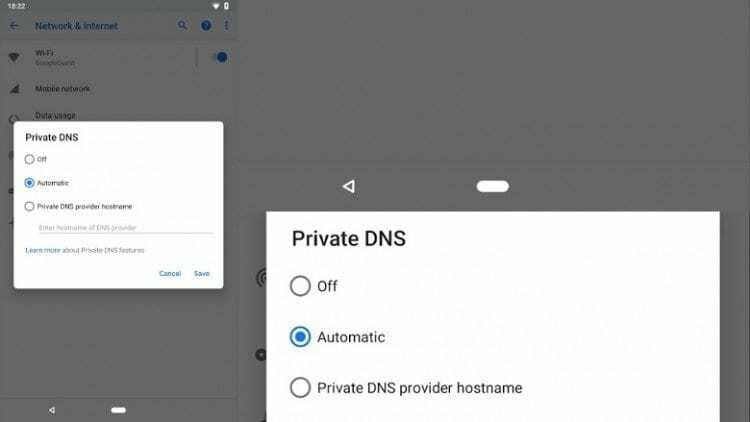 The Google announced that Android P will come with native support for DNS by TLS and that the Developer Preview already have this feature. It will allow users to choose their own DNS provider, or simply let the network where they connect choose (as it is at this time). The Transport Layer Security is allowing a secure connection via HTTPS to a website server and prevents any person to monitor the connection read or change the channel, at least when it comes to HTTP or, in this case, a domain query. But interestingly, the original version of the Android Developers blog post featured a print screen not just from the DNS dialog box, but from the entire screen. Some users noticed that the navigation bar had some similarities to that of the iPhone X: the traditional Back / Home / Multitask button combination turned into a pill-style button placed in the center, perhaps by waving a drag gesture to take the user from back to Home. Nothing has been placed on the right side of the bar, prompting some users to guess that multitasking can be accessed in another way. The second version of the Android P Developer Preview is due to launch next month on Google I / O 2018.